He says no experiment has ever been conducted to demonstrate the relationship between carbon dioxide and atmospheric temperature. Nor has anyone established an empirical explanation of the extent to which carbon dioxide contributes to atmospheric temperature. With no link between atmospheric carbon dioxide and temperature established experimentally, he set out to discover one by comparing recent records. At least over New Zealand, he found no evidence that a link exists. 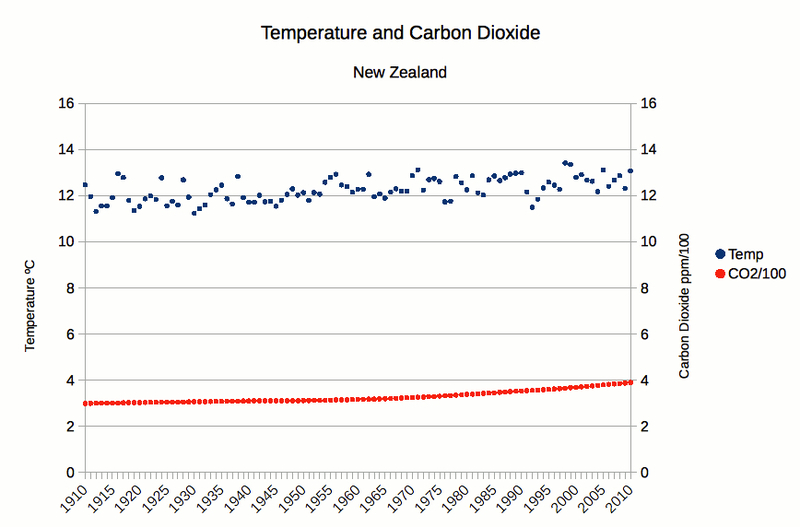 Kerkin’s Figure 3: “Temperature and Carbon Dioxide Changes Over 25-year Periods.” In each year, the 25-year records of carbon dioxide and air temperature over New Zealand show no correlation. Click to enlarge. An increase in either temperature or carbon dioxide does not appear to cause an increase in the other. Kerkin’s Figure 2: “New Zealand Temperature and Carbon Dioxide Record.” Uncorrelated, but their trends are similar—so what drives them? Click to enlarge. Our time in the sun has been pleasant and productive (though some tell us to cool it) but it could be drawing to a close. The possible future lack of warmth scares me. Zooology tells us that warm-blooded man has eveolved to operate optimally in an ambient temp of around 20degrees Celcius. A couple of degrees colder will have unpleasant ramifications in so many areas of all of our lives. I have no idea why so many politicians have a desire to cool the world, but I notice that those same politicians are not quite as vociferous as they were formerly. Perhaps good sense is breaking out, but who knows? The Reality is that Clouds control the Earth’s Temperature, and the Sun keeps the clouds away when it is active with Sunspots. Now that the Sun is in a decline of activity, consistent with the past, we are already experiencing the cold trend that is projected to bottom out between 2025 and 2030. Yes, and Cold Kills. considerthis.info for proofs that temperature claims are manipulated and we are already in a cooling cycle. An interesting essay by this retired Master of Chemical Engineering. Will it be published in a peer-reviewed journal? Will there be a press release about it? Has it been submitted to the government? So far, Gary has not mentioned publication in a journal. I understand the Coalition is organising a press release, and it has been sent to selected members of the National caucus. With temps bottoming out at -22 degC in the MacKenzie this week, I do start to question the sanity of us building a house down there. Good work Gary, as usual. Lurkers, Gary is an original ‘Statistical Audit of the NIWA 7-Station Review’ guy and an accomplished number cruncher (leaves me for dead). Gary I understand your rationale and the comparative metrics you’ve used (Temp/CO2), however I’ve been in the process of tying down the primary climate change metric and it is neither of those (perhaps surprisingly to many). I’ve commented much on this in the previous ‘Wicked Witch’ and ‘Are you a scientist?’ threads so not too much more here. My responses below to your analysis are from that stance. Note that the criteria is “the planet’s energy balance” at TOA. This is the climate change indicator – not temperature, according to the UKMO. CO2 “forcing” is currently increasing at 0.2 W.m-2 per decade (empirically, a little more theoretically). This “forcing” is supposed to be effective at TOA – it isn’t. MMCC theory has failed at the first hurdle, any other anecdotal “evidence” is moot (embarrassing for likes of Simon, Gareth Morgan, and UK Met Office). Using Mauna Loa data the theoretical CO2 “forcing” is now 1.24 W,m-2 1959 – 2014. Except it doesn’t “force” anything at TOA. The TOA imbalance is an on average trendless 0.6 W.m-2 2000 – 2010 (Stephens et al 2012, Loeb et al 2012, IPCC AR5 Chap 2). CO2 “forcing” is now double the TOA imbalance over the IPCC’s anthro attribution period. We could double CO2 levels in the atmosphere to 800ppm and it wouldn’t make any difference to the TOA energy budget. This, I think, needs to be shouted in Tim Groser’s ear. Note again that the criteria is “the planet’s energy balance” (at TOA) – nothing else. Again the CO2 “forcing” conjecture fails on these two events (strike two but already out). The IPCC’s radiative forcing methodology (RF) is in respect to 1750 and subsequent changes are relative to that date. Problem is going back in time. CO2 “forcing” does not explain the RWP or MWP because there is no CO3 forcing from ice core data. This is probably why IPCC senior adviser Jonathan Overpeck (supposedly an objective scientist) emailed Dr David Deming stating “We need to get rid of the MWP” and why the IPCC was so enamoured with the MBH98 “Hockey Stick” until they dumped it for obvious reasons in AR4 & 5.
spans to 1940 and to 1950), temperature increases over those 25-year spans are by no means continuous. Yes, the CO2 conjecture breaks down again (strike three but already out – twice). I’ve done linear analyses of both NIWA 7SS and BEST 37SS but starting 1970/72 because the data is non-contentious after that date (and 1972 is when NIWA’s Virtual Climate Station Network, VCS, starts. It corresponds with BEST). In both datasets there is a flat/cooling trend 1970 – 1997, an abrupt 0.4 C shift, and another flat/cooling trend thereafter. The shift is natural (solar-fueled El Nino). CO2 plays no part in NZ temperature over this period. So apart from disagreement about climate change criteria, I’m with you Gary on Temp/CO2 correlation breakdown. By 1970 GAT leads CO2 by some 20 years (strike four, but who’s counting now?). The New Zealand downscaled projections follow the IPCC Fourth Assessment approach. That is, changes are relative to 1980-1999, which we abbreviate as “1990” for convenience. Changes are calculated for the two future periods 2030-2049 (“2040” for short) and 2080-2099 (“2090”). Thus, the New Zealand projections are 50 and 100 year changes, between the baseline climate (centred on 1990) and future periods centred on 2040 and 2090. You might have to download the spreadsheet because what you see in Dropbox is not what you get in Excel. Predictably, the prediction is not tracking observations. The prediction trend is 1.8 C/century, the observations trend is 0.72 C/century. Note that the prediction is an IPCC/MfE/NIWA collaboration – and all of them are wrong. Tim Groser should be told about this too. RT thanks for the update. I look forward to the various responses, if any. I like to look at credentials of new ideas as well as the ideas. Kerkin’s ideas here are interesting and I agree with his premise that there should be empirical (localised) studies to validate or invalidate a hypothesis such as AGW. If I may play devil’s advocate however, it seems to me that this essay should be no more that a blog post and will wither under the crossfire from global warming advocates. – Figure 4 is simply a scatter graph of the ill-defined suppositions of Figure 3. – Kerkin is pushing a (lightweight) barrow and it shows. For example, “My enquiries regarding the highs and lows of temperature over the Holocene suggest that what is happening to temperature now is not unique, that its increase is not likely to be as disastrous as some would have us believe, and that the present warm period is not caused by the actions of mankind.” This statement is only supported by his proposition that there is no correlation between NZ CO2 levels and NZ temperature, which in itself is weak to my untrained eye. He does not illustrate the non-uniqueness nor does he show his reasoning for non-disaster. So the statement should be revised, in my uneducated opinion. It is not a scientific statement. It is an op-ed, which he is entirely at liberty to make in a blog post, for example. But not a scientific paper. – The 3 tables are not well explained to my uneducated mind. His essay speaks of a chronological order yet there are no dates in the tables. Sorry, I am easily confused by such apparent lapses in clarification. – His source data for CO2 concentrations over New Zealand seems to be obscure and weak. He says in this regard “Establishing the concentration of carbon dioxide in the atmosphere around New Zealand is difficult for at least two reasons: most recordings of carbon dioxide are spot readings taken at specific, isolated locations, one of which, until recently, was at Baring Head on the south coast of the North Island of New Zealand; and the atmosphere is not “well mixed”, i.e., carbon dioxide is not uniformly distributed through the atmosphere.” This statement weakens his core argument, fatally if I were the devil. At the risk of being called a total ignoramus when criticising a well-educated gentleman, and doubly so in the presumption that Gary is a friend of yours RT, I feel obliged to speak up as must a skeptic. Correct me please. Please ask this genius to release his seminal study revealing that the Earth is flat. As I understand Gary’s rationale, if a relationship exists, 25 years is plenty of time to reveal it when over successive 25 year periods incremented one year at a time. This is exhaustive. If a change of CO2 concentration occurs there should be a corresponding change in temperature over each successive 25 years or at least an indication of cause/effect – but there isn’t. This relationship does not exist in NZ data obviously. It should begin to emerge from about the 1950s and become more and more apparent as CO2 concentrations increase but instead, temperature is completely independent of CO2. My own trend analyses of NIWA 7SS (annual) and BEST 37SS (monthly) returns the same conclusion. From 1972 – 1997 (26 years), just prior to the strong El Nino (+0.4 C shift, solar-fueled), there was a negative/flat -0.024 C/decade trend in both NIWA and BEST. These are years of good, non-contentious data. The El Nino shift is very pronounced in NZ data, much the same as radiosondes and satellites and contrary to NOAA’s Karl et al (2015). After the shift the recent trend is negative/flat again, so again, no CO2’temp cause/effect. Basically for 1972 – present there were 2, on average, flat climate regimes prior to and after 1997 unrelated to CO2. In reality of course (see Figure 2), the temperature data is all over the shop. If there was to be an indication of CO2/Temp cause/effect then it should show up in just the 26 year period prior to 1997 alone because CO2 was steadily rising and the temperature data is as good quality as it probably ever will be with no significant natural events to contend with. But instead an almost inverse relationship exists. Which part of ‘Download essay: “Carbon Dioxide and Atmospheric Warming” (pdf, 349 KB)’ is unclear? I see the “crossfire” has begun but not in the terms Mike suggested it would. I predict more (probably much more) “crossfire” in the vein of Henderson than any other. What is radiative forcing? The influence of a factor that can cause climate change, such as a greenhouse gas, is often evaluated in terms of its radiative forcing. Radiative forcing is a measure of how the energy balance of the Earth-atmosphere system is influenced when factors that affect climate are altered. The word radiative arises because these factors change the balance between incoming solar radiation and outgoing infrared radiation within the Earth’s atmosphere. This radiative balance controls the Earth’s surface temperature. The term forcing is used to indicate that Earth’s radiative balance is being pushed away from its normal state. Radiative forcing is usually quantified as the ‘rate of energy change per unit area of the globe as measured at the top of the atmosphere’, and is expressed in units of ‘Watts per square metre’ (see Figure 2). When radiative forcing from a factor or group of factors is evaluated as positive, the energy of the Earth-atmosphere system will ultimately increase, leading to a warming of the system. In contrast, for a negative radiative forcing, the energy will ultimately decrease, leading to a cooling of the system. Important challenges for climate scientists are to identify all the factors that affect climate and the mechanisms by which they exert a forcing, to quantify the radiative forcing of each factor and to evaluate the total radiative forcing from the group of factors. There’s been no “pushing” at TOA this century, the imbalance has already been pushed and is a stable accumulation (surplus). The imbalance, if actually abnormal, I doubt it, has been a stable 0.6 W.m-2 in recent updates (see IPCC AR5 Chapter 2). Meanwhile CO2 “forcing” from Mauna Loa data is double the imbalance i.e. CO2 “forcing” is ineffective at TOA where any forcing effect is measured therefore CO2 is not the driver of the imbalance. And “forcing”, if any, is measured at TOA in IPCC terms and methodology, not the surface i.e. surface temperature is irrelevant to this criteria. The imbalance of energy in to energy out is simply due to solar change and the oceanic heat sink which, according to Dr Kevin Trenberth, adds “10 -100 years” system lag. Given that lag time, there’s no way of knowing what energy budget is “normal” at TOA. The sun is going into recession therefore, relative to recent maximum solar input, an energy deficit. The deficit must, given lag time, eventually “push” the earth’s current radiative balance away from it’s present state i.e. from energy accumulation (surplus) to balance then to dissipation (deficit) which is just another imbalance. The notion of “normal state” is idiotic given solar change over millennia and glacial – interglacial periods. Was the Laurentide Ice Sheet covering North America “normal state”? It was back then, why isn’t it now? Figure 3 Comparison of net TOA flux and upper-ocean heating rates. There is no 0.2 W.m-2/decade CO2 forcing (empirical, Berkeley Labs) evident in the TOA observations (IPCC confirms) and in all years except 2009 the TOA imbalance is less than CO2 forcing which, using Mauna Loa data from 1959, is now 1.24 W.m-2. CO2 forcing is therefore a completely ineffective energy driver at TOA in accordance with forcing criteria. Therefore there is no point looking for CO2/Temp correlation, or not, at the surface (I’ve done this myself too) when CO2 falls at the first hurdle, TOA. Anything else that happens anywhere else is rendered moot, of no consequence, and of no relevance requiring consideration. No falsifiable hypothesis has been written for the theory of anthropogenic global warming (AGW) a.k.a. man-made climate change (MMCC) so let’s write one in terms of the critical criteria. This is falsifiable and is falsified by live real-world experiment results (TOA obs). Yes. Done for all regions of the world, the complete picture would confirm the IPCC theory that CO2 drives global temperature, if it’s correct. Figure 2: Yes, correlation in the long term, but not causation. Figure 3: This is a brilliant move, for data showing long-term correlation, if confirmed in the short term, would give confidence of causation, while lack of short-term correlation strongly disputes causation. Yes, Figure 4 is confusing—as one would expect in the absence of correlation. “My enquiries regarding the highs and lows of temperature over the Holocene” — yes, this is the op-ed part and is unsupported by his investigation into NZ temperatures and CO2 levels. But, as you say, he’s entitled to say so in an essay or blog post. Gary is economic with his descriptions, probably because he understands the tables too well, but the facts are there. To create the tables, he has worked through the graph in Figure 3 from left to right, each line showing the two pieces of data for one year. He slots each year’s data into one of three groups representing the three ranges of magnitude he chose for temperature change. The lines of a group are listed in date order. He concludes: “These three tables show clearly that there is no obvious relationship between an increase in carbon dioxide in the atmosphere and a corresponding increase in temperature over New Zealand. The progression from top to bottom is chronological as indicated by the carbon dioxide values.” Note that CO2 declined in the 1940s and early 1950s but otherwise increased. “His source data for CO2 concentrations over New Zealand seems to be obscure and weak.” So it may seem, but he’s using the best available data, while the IPCC uses only the spot readings from Mauna Loa (Hawaii) and applies them to every region of the world. When Gary complains that “most recordings of carbon dioxide are spot readings taken at specific, isolated locations” he criticises the IPCC for this practice and when he says “carbon dioxide is not uniformly distributed through the atmosphere” he highlights the spurious claim to the opposite by the IPCC. The newly available data from NASA’s OCO-2 satellite clearly show wide variations between regions, in contradiction of the IPCC assertion that CO2 is well mixed. Since the warming effect of atmospheric CO2 is instantaneous, absorbing and emitting heat radiation continuously, regions and moments of high CO2 concentration would heat more than regions of low concentration. This seems to be an area where data is limited and no one is investigating it. But it may not matter much whether it’s well mixed or highly variable, as this new analysis finds no evidence that CO2 has any significant effect on New Zealand’s surface temperature. Now you and others can correct me if necessary. Maybe someone would like to explain to me how the 25 year values are calculated in Figure 3? It does not appear to be a rolling mean. Has the author simply taken the difference between two discrete points in time? If so, what two points are chosen for a given year? Would anyone like to speculate on why this approach would be statistically inappropriate? Gary doesn’t say but I think you can safely assume the change is calculated by linear regression of the data. Salinger wrote papers on NZ climate determining change by taking the average of the first part of the period, the average of the last part, and the difference between the two. I personally favour this approach rather than linear regression but it has fallen from favour among the climate science fraternity. I don’t think this is what Gary did though. He is simply following the practice of the day (linear regression) i.e. don’t criticize Gary for this, criticize climatology. Small CO2 changes return large temperature changes and large CO2 changes return small temperature changes and the same temperature change corresponds to diverse CO2 changes.. And Figure 4 shows large CO2 changes returning negative temperature changes and small CO2 changes also returning negative temperature changes. Clearly CO2 is not the driver of NZ temperature. If you look at recent linear trends of NZ temperature data (say 1970 – 2014), the data immediately prior and immediately after 1997 is not at all linear i.e. linear analysis is statistically inappropriate unless the data resembles a line. For this reason I don’t think the analysis has any meaning (actually invalid) past 1997 because there was an abrupt +0.4 C shift immediately after 1997 (identified by linear regression of the data before and after 1997). The shift can be identified by the Salinger method above and that is in fact how he quantifies the Great Pacific Climate Shift in the 1970s. If Gary used 7SS annual then I don’t think the R2 values will be that great and especially bad for 25 yr periods spanning about 1995 to 1999. But if he used monthly then much better I suspect but still bad across 97/98. BEST monthly is essentially linear before and after 1997 from 1972 onwards. Note the words “simple analysis” i.e. he does not purport to have done an analysis that satisfies everyone’s criteria as what is statistically valid and appropriate or not. This is an indicative study, given the indicative results there’s not much point carrying on any further. Some of them but not all. The negative temperature changes in Figure 4 are missing from the tabulation. Many thanks to both Richards for patiently and congenially explaining the ‘between the lines’ logic which my simple brain simply could not simply. I would suggest that the essay could be less cryptic and that fuller explanations along the lines of your two replies might make it more comprehensible to a wider readership. I now have a clearer understanding of the essay and its ramifications. In light of your tutorship I will reread the essay and may comment again as time permits. Again, thank you both. On another matter, RC says “I predict more (probably much more) “crossfire” in the vein of Henderson than any other.” Henderson’s troll-like drive-by is not worthy of any response whatsoever and reflects very poorly on Henderson’s wit and intelligence. Had he raised one valid question or criticism it would be worthy of our attention, but if you RC predict more of this empty-headed rhetoric then it will be no problem at all, as they all will be rightly ignored. I doubt that Gary has applied a regression to each year because if he did neighbouring years would be strongly correlated rather than exhibiting large differences. I still suspect that the method is the simple difference between the start and finish year. If that is the case, then any period comparison will be nonsense; it is the equivalent of trying to derive a trend from two data points. The article should clearly state what methodology was applied. If you look closely at Figure 3, you will see that the cumulative sum of the temperatures appears to be correlated to the cumulative sum of the CO2 measures. It is consistent with the apparent correlation between temperature and CO2 in Figure 2. Correlation does not necessarily imply causation but in this instance we have a theory which supports the evidence. Unless you assume that the 7 Station Series is flawed, but there is no mention of this in the article. One could argue that the 1991/92 temperature plunge, about the inverse of the 97/98 El Nino, is not “essentially linear”, it’s clearly not. My reasoning though is that there is no ongoing effect of ENSO activity as there is after the 97/98 El Nino. Annual is not that representative so an additional year of annual data can return some weird trends. But point taken and it’s a good one. I agree Gary should have provided his method in detail. But given Gary’s experience with data of this nature I don’t think his method will be an issue once disclosed. You may well be correct but remember annual is the average of 12 data points so is not one “discrete” datapoint. This is actually Salinger’s method although he used more than one year I think I recall but how many I would have to look up. I’d be very surprised if Gary has used just one year of averaged monthly data at each end of a 25 yr period. Not even close given the temperature changes. The major changes occurred in the mid 1950s and late 1960s. The 1950s when CO2 change is least i.e. no correlation. The cumulative temperature change curve would have the greatest increase in the first half of the graph and the least in the last half. 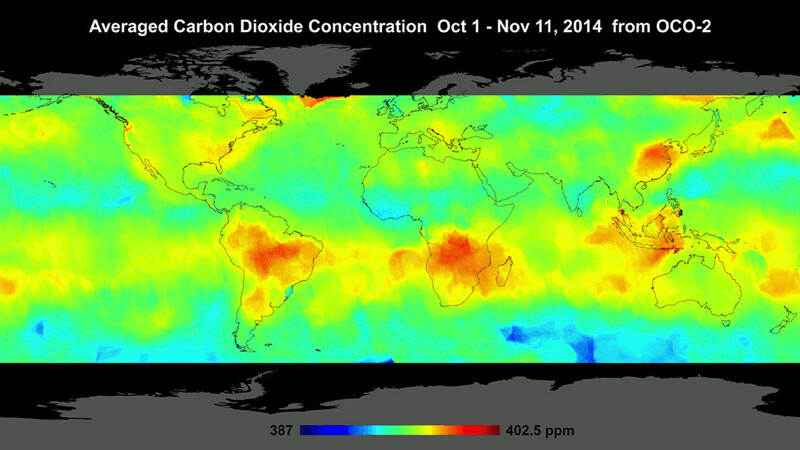 CO2 has the least increase in the first half and the greatest in the last half i.e. again, no correlation. A cumulative curve does not reveal any underlying physical basis anyway unless it’s non-CO2. It obscures periods like 1976 – 1983 and 1991 – 1997 for example when temperature change was predominantly negative apart from the odd aberration. Both of these periods are in the second half when CO2 change was large and positive. The large and positive temperature changes occurred in the first half when CO2 change was small. No you don’t racehorse. You don’t even have a credible theory let alone evidence supporting it. I’ve just had a quick look at the 7SS annual data and it does look like Gary has used the one year average at the beginning and end of 25 years and the difference between. So I think you are correct Simon but we’ll have get confirmation. 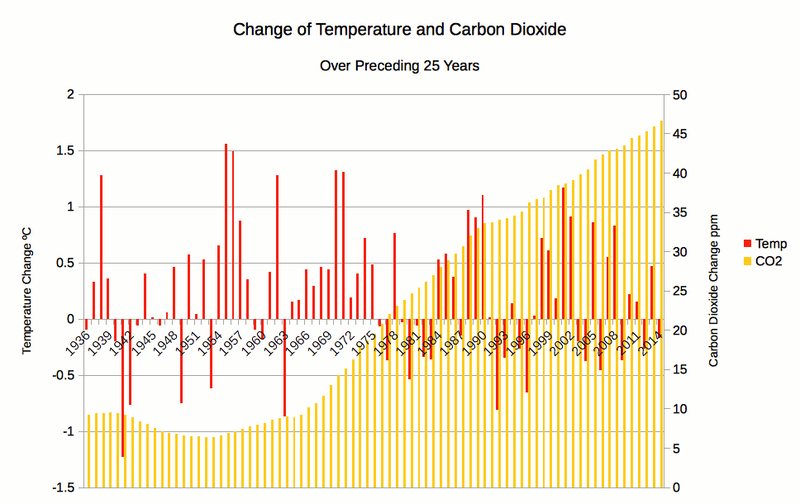 Presumably CO2 is the same so it’s an apples-to-apples comparison with the 25 year frame moving forward incrementally. Salinger used this method to determine climate regime difference so it’s not as if it’s invalid. The only difference in approach is the number of months averaged at each end. I would have preferred to see more than 12 months but fact remains it’s apples-to-apples if CO2 is the same. No it’s not (assuming the method is the difference between start and end rather than regression). It is determining the absolute difference between 2 regimes. In this case (our assumed method) the first regime is the average of 12 months of data at the beginning of the window and the second is the average of 12 months of data at the end of the window. The 2 regimes are separated by 25 years. This is not a trend by any stretch. What Gary is demonstrating is that as time progresses, CO2 does not have an increasing effect on temperature as the 25 yr window moves along the years that a CO2/temp cause/effect should exhibit. If there was cause/effect the graph should show more and greater positive temperature changes in the second half of the graph than the first. Instead the inverse is the case. That’s it nothing else, all other “overwhelming evidence” and “multiple lines of evidence” are anecdotal observations that are many times removed from the hypothesis and not necessarily connected with it and are certainly not if the hypothesis is null. This is a falsifiable hypothesis with measurable variables relevant to the criteria. Actually falsified by live real-world experiment results (TOA obs). To attempt forming a hypothesis at the surface is barking up the wrong tree scientifically. So are exercises that assume some vague surface theory and then analyze variables pertaining to it. I’m as guilty of this as anyone but I wont be pursuing that anymore now that I know what defines climate change in terms of forcing. These being the definitions as laid down by climate science. The climate change metric to monitor in the first instance to determine CO2 forcing effect, or not, is TOA energy balance – not surface temperature. If CO2 has no effect at TOA (and none is evident) then surface temperature is driven by some other forcing, the same forcing that is driving the TOA imbalance, whatever that is. To attempt forming a hypothesis at the surface is barking up the wrong tree scientifically. Surely this would be a game-changer in the debate. It obviates the need for accurate surface temperature or ocean temperature data (in the debate). And planetary thermal lag is neglected in their cause/effect conclusion. A conclusion based on a thermodynamically illiterate approach. Sure Mike but I’ve written a lot about it already in this thread, and the ‘Are you a scientist thread and the ‘Wicked Witch’ thread previously. It’s actually quite simple no thesis required. I suggest that you start from my first comment in this thread and read down. Then go back to the other threads, there’s references and links to literature all the way including to IPCC. If you’re still mystified just comment anywhere and I’ll write a brief synopsis (I get the comment feed). No it wouldn’t. The game changer is in same game as has always been played at TOA by climate science. It’s just that a formal hypothesis has never been written in those terms. And because of this everyone has been, as I’ve put it, barking up the wrong tree scientifically. Climate science defines climate forcing in terms of “the planet’s energy balance” at TOA – not the temperature at surface. Since 2012 we’ve had an update of the TOA imbalance (“steady” 0.6 W,m-2) and we can calculate the theoretical CO2 forcing over the anthro attribution period (1.24 W.m-2 1959 – 2014 from Mauna Loa) and we know from Berkeley Labs (2015) the empirical CO2 forcing (0.2 W.m-2/decade 2000 – 2010). Theoretical is a little more than empirical note. Problem is, CO2 forcing is now double the imbalance therefore CO2 forcing is not the driver of the now steady TOA imbalance i.e. it is a completely ineffective forcing. This is the game changer that no-one is highlighting (the IPCC certainly don’t). It is also something of a debate killer, the debate is over if it cannot be shown that CO2 is the driver of the energy balance at TOA and it can’t. It’s also a policy killer. Tell Tim Groser. Solar radiative energy is energy into the atmosphere at top of atmosphere (TOA), outgoing longwave infrared radiation is energy out of the atmosphere at TOA. Observations allow a budget (see literature linked elsewhere). if there is more energy input than output, the planetary system (mostly oceanic heat sink) is accumulating energy (surplus). This is the situation now. If there is equal energy in and out there is perfect balance. This is not “normal state” IMO and probably rare and short lived. If there is less energy in than out the system is dissipating energy (deficit). This is the situation predicted if the solar recession continues to deepen. Planetary thermal lag in the sun => ocean => atmosphere system means the atmospheric response to solar change is lagged somewhere between 10 and 100 years depending on calculation or empirical study. I don’t think he has long enough lag (i.e. his temperature drops too soon). He calculates 14 +/- 6 yrs lag from thermodynamic principles (land+ocean). I think he says the ocean alone adds 20 years, land a lot less obviously. There’s other literature on this, for example Zhao & Feng (2014) found a 30 – 40 yr sunspot number (SSN) to temperature lag in Antarctica over millennia. I’m not anticipating solar change to show up in temperature until after 2010 (maybe well after) but I could be wrong. You can add the lag to either the Grand Maximum peak (1986) or to when TSI dropped (2006). I’m inclined to use 1986 to give an idea of the start of the atmospheric response (which could be insignificant initially anyway) so using Z&F14, 1986 + 35 = 2021. The current global temperature state is more about the oscillatory component (PDO+AMO), a solar effect from the recession wont kick in for some time because the power change from Grand Max is minimal right now (about 0.3 – 0.4 W.m-2). And because the land mass is predominantly in the Northern Hemisphere the temperature response will show up there first and the ongoing effects greatest. With NZ surrounded in ocean it will probably show up here last (could be wrong of course). During the solar Maunder Minimum the Bosphorus froze over at Istanbul (Constantinople) and people walked across from Asia to Europe and vice versa. This is the extreme Little ice Age scenario again. First scenario is Gleissberg, then Dalton, then Maunder in increasing severity. I’m hoping for none of these. Thanks to you all for your questions, comments, thoughts and criticisms. I think it fair to say that this represents proper and rigorous debate––with one exception! Usually I would forbear from responding to Alan Henderson but, in this case, it is worth noting that his metaphor is not particularly apt and that it does not take a genius to analyse the information as I did. He too can do it and no doubt will have to reach the same conclusion. I had a similar argument on Quora recently and two people pursued it, with a little more intelligence than Henderson, but gave up when I challenged them to repeat the exercise with their national information. Richard C has answered most of the queries but I appreciate that, as Richard T has stated, I was economic with my explanations. I will explain this in a bit more detail but at the outset let me make it quite clear: there is no statistics involved in the essay. No correlations––auto- co- or cross-. Just, and only just, differences. Richard T pointed out that I used only those differences in temperature which were positive. I saw no need, and I still don’t, to use spans over which the temperature fell. I considered those spans would not contribute anything to the argument since I was looking for temperature increases related to carbon dioxide increases. Mike indicated that Figure 2 shows a trend correlation. Well, of course it does, and I referred to in the essay. But I also pointed out that it does not indicated a relationship, let alone a causal relationship. And, Mike, since Figure 3 is a plot of 25-year diffences why would you consider it a statistical nightmare when no statistics are involved in producing them? Just differences! Richard C does point out, quite rightly, that the Seven Station Series is a series of annual averages. That that is subject to valid criticism is not a justification for not using it in the absence of better information. And, as I pointed out in the essay, it is has de facto status as the New Zealand record. The section you quoted, Mike, relating to temperatures during the Holocene, is intended to give some perspective. After all, the temperature record for the Holocene is reasonably well established through published papers. Interestingly, although you find the argument “weak” if you were to correlate the data in the tables I suspect it would show a very small correlation coefficient. Unfortunately you do not show a good grasp of statistics (even though none are used in the essay) in your comment on Figure 4. I included the plot of the differences in carbon dioxide and temperature merely to show, even to the untrained eye, that there is no obvious relationship. You might like, though, to explain what you consider to be the ill-defined suppositions. I will refer to the use of differences later. Mike, your criticisms of the carbon dioxide data are well founded. I took some pains in the essay to explain the deficiencies. Unless you can provide me with better carbon dioxide data for New Zealand, which I would dearly love to see, and which would, I would be prepared to wager, not provide me with a different conclusion, I think your criticism is unfair. In this life we have to work with the best information available! Thanks for your comments. They are well taken and you are justified in making them, if only to achieve clarification at least. Simon asks how the 25-year values are calculated but then goes on to, effectively, answer it for himself. Yes, two end points are selected and the difference is the value of the latest one minus the value of the earliest. As I pointed out above, there are no statistics involved. It is certainly not a rolling mean. The only valid criticism might be the selection of end-points which have been calculated by others, as in the annual average temperatures calculated by NIWA, and annual average carbon dioxide concentrations calculated by a variety of sources. You can look at all these your self–– I refenced them all. Whether it is valid to use a span of years is moot. I could have taken the average temperature for 1910, that for 2010, and the corresponding carbon dioxide values. I would, of course, find that there was an increase in temperature, and a corresponding increase in carbon dioxide. It would not, though, have identified a relationship, and had I claimed it did, you would all have jumped on me with the proverbial tonne of bricks. And so you should. The question then is what span of years would enable us to observe what might be happening? The normal climatological span is considered to be 30 years but I understand that this is somewhat arbitrary. Why not 10 years? Or 50 years? I would suggest that 10 years would be too fine a resolution and 50 years too coarse to gain an understanding of the larger picture. So why not 25 years? It is convenient and gives a reasonable number of spans over a 100 year range. I rather suspect that 20 years and 30 years would reveal much the same picture. Someone else might like to undertake that exercise. Finally, I am not a scientist in the physical or chemical sense, although I could claim to be an engineering scientist. My thesis was about stochastic analysis of the nature of two-phase fluid flow and how it can be deduced from non-intrusive data capture. I must confess to having forgotten most of the maths involved in the statistics and Fourier spectral analyses required! It was a long time ago. The essay was not put together for the purposes of publication in an appropriate journal. I have neither the time or the inclination. As far as peer review is concerned, you are all doing a great job. Thanks, and keep it up. Yes and no. Both are H2O in different phases (liquid and gas) and both are TOA forcings but ONLY IF there is sufficient change over time to show up in the TOA energy budget. To date undetected therefore negligible and ineffective (the opposite at the surface in the case of cloudiness however). All IR absorbing particles in the atmosphere, if an effective forcing e.g. H2O, CO2, CH4, aerosols, etc, are a direct instantaneous TOA forcing at the speed of light but the magnitude of the forcing must build up over time. Solar forcing is indirect, via the ocean, over decades. There is nowhere near enough satellite data to make any conclusion re solar forcing at TOA. Ideally satellite monitoring would have started in the 1600s. Would have been good from 1750. Still very useful from 1800 or 1900. But we are stuck with when the satellite era began. The alternative is proxies but the uncertainty takes a giant leap and the whole issue becomes highly contentious with wildly varying estimates. The IPCC discards the estimates they don’t like or can’t understand (e.g. Shapiro et al). There is a paper out (Ineson et al) that uses CO2-forced models to discount solar in projections out to 2100. IPCC AR5 Chapter 9, Radiative Forcing cites a similar paper by Gareth Jones, Mike Lockwood, and Peter Stott (2012) that is almost the IPCC’s ENTIRE contra-solar case. If you look at the models vs observations in the papers though, Jones et al was already wrong in 2010 and Ineson et al are already wrong in 2015. Mike, the reason I’m reluctant to immediately write a thesis or synopsis re the TOA climate criteria is that if you have not done some background reading of what I’ve pointed you at (this thread at least and two others, and the references), you will not have learned the terminology, definitions, or be familiar with any of the literature or relevant references. In other words I’ll have to explain far too much background. I’m sure that having done the background leg work even a synopsis would be unnecessary, you should see what it is all about from that. But if still required, you would at least then know the necessary background so the synopsis is then little more than a few bullet points. # Climate science prescribed the criteria long ago. # It is repeated in IPCC assessments and FAQs (see upthread) and on institute’s websites (e.g. UKMO). # Everyone has forgotten or ignored this or is unaware of it and gone off on wild tangents. Went looking for the Salinger paper that uses differences of averages to determine changes but can’t find it again. Salinger (1993) uses linear trends but it wasn’t that. I’m sure I saw the technique in a Salinger paper but whatever I saw I can’t find again. 1) 8 years is 8 seasonal cycles vs 1 cycle for Gary’s 1 year. 2) Before and after are equally weighted as is Gary’s. 3) They have no gap between whereas Gary has a 23 yr gap (?) and a moving 25 yr window. 4) Gap or no gap is effectively the same technique. 5) They account for interannual variability (Std Dev), Gary doesn’t but he tells us his analysis is “simple”. 6) Theirs is an ideal method to quantify the 1997/98 El Nino shift in NZ temperature. 7) 1 yr average annual is 12 months average monthly which is in turn, averaged daily data. For Gary’s study, 1 seasonal cycle is adequate as long as there is equal weighting at each end of the gap for both temperature and CO2 (there is). I would however have preferred to see maybe 3 or 5 seasonal cycles averaged to give 36 or 60 months respectively. Rhodes & Salinger (1993) stipulates 1 yr and 2 yrs either side of a step but for monthly data – not smoothed average annual. Gary’s 1 yr at each end of the gap does however reveal the lack of any cause/effect over time as the 25 yr window moves along the entire series. 3., 5, or 8 yr’s annual average is less sensitive to the fluctuations in temperature. 1 yr is very sensitive to the fluctuations in temperature but highlights the difference with CO2 (Fig 3). Actually they do – the 1976 year. Thanks for the essay and your unprotesting elaboration. In discussions of this sort the subject of statistics is always raised. Have the appropriate statistics been used? Is the conclusion statistically significant? Can we believe it? I have called my analysis “simple” for very good reason. I have not got into the statistical game because it leads nowhere. As far as I am aware all the statistics which have been applied to temperatures and other important climate parameters are based on Normal, Gaussian, unimodal distributions of the parameters and their errors. I am not in a position to comment on the CO2 data for reasons I stated in the essay…there is no sufficiently fine resolution data to enable some statistics to be identified. But I can assure all that the raw temperature data underlying the seven station series is far from unimodal and Normally distributed. At the very least it is bimodal and even multimodal and strongly skewed. To assume that it is Normal, therefore, is a stretch of the imagination. Worse, the methodology of Salinger and NIWA in inferring temperatures from other, “near”, stations can really only be applied if the statistics are similar i.e. have the same sort of distribution––modes and shape. To be fair, in terms of my own arguments, they used the best information available at the time. But they should have recognised the deficiencies in their analyses. Worse, many authors choose to ignore the absolute errors in measuring temperature which, as Watt showed, can be as much as ±2ºC. (Sorry I don’t have the reference to hand, but a search of Watts Up With That will find it.) This being the case, what is the value of claiming that temperature changes of 0.1ºC or smaller are statistically significant? What does it really mean that the temperature in the last century has increased by 0.6 to 0.8ºC.? A recent paper published on the biases inherent in establishing the “hiatus” – POSSIBLE ARTIFACTS OF DATA BIASES IN THE RECENT GLOBAL SURFACE WARMING HIATUS, Science 26 June 2015: Vol. 348 no. 6242 pp. 1469-1472 DOI:10.1126/science.aaa5632. But, in this they discuss differences in terms of 1/100ths of a degree. We can’t even measure that in the atmosphere! Satellite measurements may have better accuracy but from time-to-time I see reports that the data are subject to ongoing revision and adjustment. In reality, therefore, changes less than 1ºC should to be relegated to “noise” but since they are not, I consider it better to fall back on a simple approach. Running 50 year linear annual temperature trend calculated from monthly global average surface air temperature anomaly provided by to Hadley CRUT, The blue line represents the 50×12 month linear trend, plotted at the last month included in the analysis. As the HadCRUT4 record begins in January 1850, the first 50 yr plot is for December 1899. Last month included in analysis: April 2015. Last diagram update: 5 June 2015. Running 50 year linear annual CO2 trend plotted against this would be good for chuckles. Also an easy spreadsheet exercise I would have thought. No pain but plenty of gain. I don’t know but seems to me 25 yr linear regressions at each 1 yr increment would be a mission unless you’re a VBA expert or something. Yes it would be but surely all it would do would be to give something like an envelope of tangents to what is likely to be a higher-order regression. Yes, I did use a spreadsheet (LibreOffice xls). Calculating the differences is relatively easy if two columns are set up with the start row in one and the end row in the other and using INDIRECT() to derive the correct difference. I guess from my thoughts above on statistics you will appreciate just how reluctant I am to devote a huge amount of time to something I consider inappropriate. That’s the envelope you describe (I think) and it is clearly unrelated to CO2. The higher order regression is about 0.8/century (I think) and doesn’t tell us anything in terms of CO2-Temp comparison. But a similar envelope of 25 yr trends on NZ data would be more sensitive (but far less sensitive than your technique). And almost the inverse of the CO2 envelope, again telling us a lot about the lack of relationship. I think you’ve demonstrated that anyway by simple method. Statistical linear trends would be much more work that could cancel nap-time. I appreciate that.